Riders who compete in more than 1 category throughout the season will score points in each category. Points cannot be shifted from one category to another. You can choose to ride any course at any event. At age-class events, you can choose to ride competitively in either your age-class, or a younger age-class (e.g. 55 year old man riding in M40), or you can choose to ride non-competitively on any course you wish. 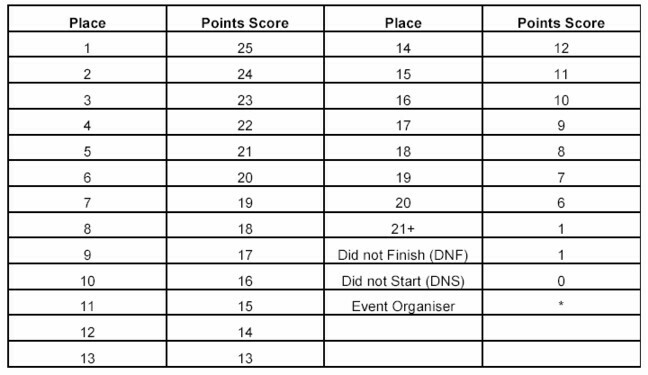 Note that if you ride different courses at age-class events (SS3/4) compared to normal events in the 2012 Cranks Bikes NSW MTBO SuperSeries, you may earn SuperSeries points on two different courses which cannot be combined. The requirement that there were at least 3 riders who rode in at least 5 events before a winner could be declared in any given category has been waived in 2012. • The same number of points as they scored in the previous NSW MTBO SuperSeries event, or 20 points whichever is greater. • If they did not compete in the previous MTBO SuperSeries event, then they will be awarded 20 points.